“Who are the heroes that fight your war? Mothers who have no say. The United States has been at war for seventy of the past one hundred years. And even as American soldiers have fought overseas, war has profoundly influenced almost every aspect of American society on the home front—as this startling collection of wartime letters, song lyrics, poems, editorial cartoons, newspaper articles, leaflets, and government documents (from the Spanish–American War and World War I to the Vietnam War, the Persian Gulf War, and the war in Iraq) reveals. 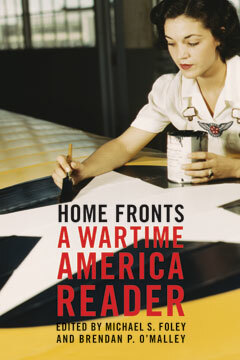 Home Fronts offers a vivid cross-section of American intellectual, political, and cultural life in wartime over the past century. Here are brief excerpts—set into historical context with concise introductions—from the most important work by intellectual luminaries, political activists, poets, songwriters, and presidents. Across the rich variety of social commentary, political critique, and artistic expression—which covers the full spectrum from pro-war to peacenik—Home Fronts brings into sharp focus the startling continuities and revealing contrasts between past and present wartime experiences. A major historical resource, Home Fronts will also be an important intellectual tool for anyone contemplating the impact of war in our own time.